Vientiane is the capital of Laos, which is closely next to the Mekong River on the left bank. Founded in 4th century BC, Vientiane is a city with a long history. 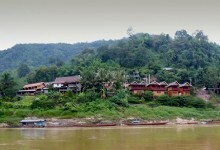 This city has been the capital of Laos and economic center since 14th century AD. Vientiane is different from countries’ capitals, especially the developed countries. It is much more a small town whose area is not so large, but people’s life rhythm is slow, showing a sense of leisurely and comfortable. In tourists’ eyes, Vientiane is an Arcadia for it is so serene, so peaceful. In Vientiane, you can find many interesting places for fun, such as Triumphal Arch, South Goose Lake and Wat That Luang. Vientiane is both a historical ancient city and a Buddhist holy land. In the city, there are many temples, pagodas and monument groups. Wat That Luang is a group of tower buildings, enjoying a high reputation in architectural art. 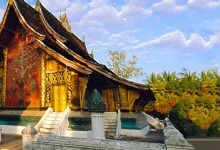 As the most important and most famous pagoda in Laos, Wat That Luang has become an indispensable part of the Lao people. Wat Haw Pha Kaew has been through damage and repair in the past.